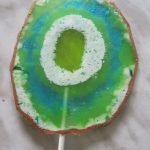 Jumbo lollipops made from crushed candies | Food, glorious food! Candies? They’re colourful, sweet and delicious. That’s why kids love them! 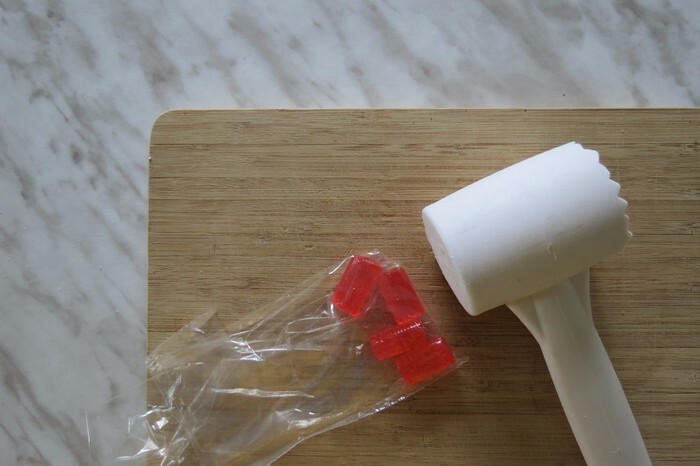 Here’s a fun way to take those candies to a higher level! 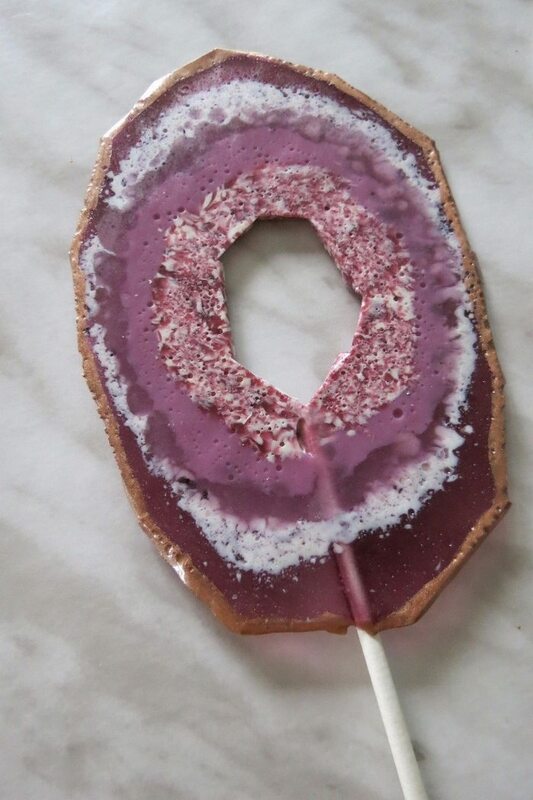 These are jumbo lollipops, about 5″ in diameter, that look like beautiful agate slices! 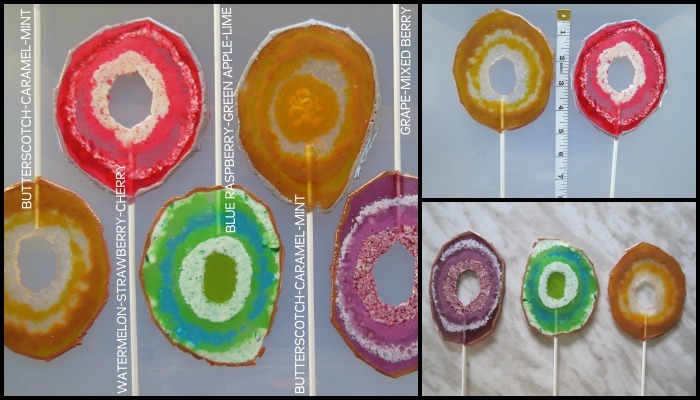 To make these, you need at least four different types or colours of candies for one agate lollipop. You also need to take note of the opacity of each candy to be able to get the design/look that you want. 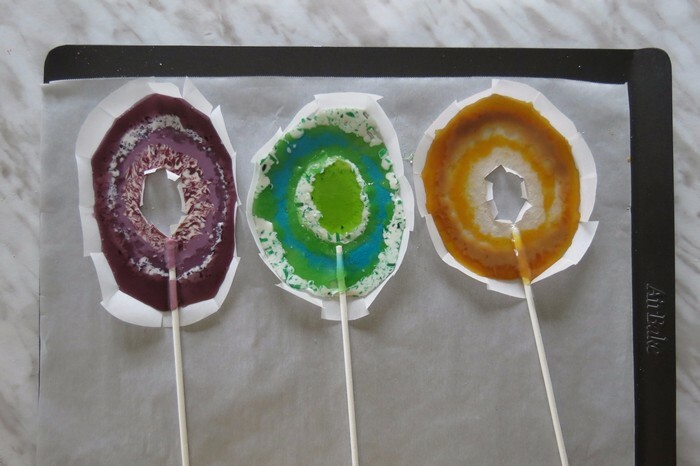 When this was first tried, all the candy rings were arranged and baked in just one go. But this did not yield the desired agate slice look, and everything got mixed up instead. So make sure to carefully follow the complete tutorial below! 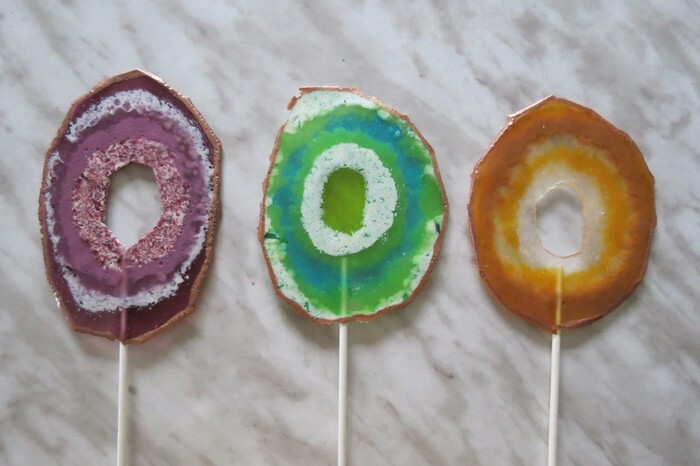 These agate lollipops are holiday season treats the kids will surely love. 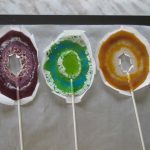 You can even have them involved making these fun lollipops by letting them crush the candies! 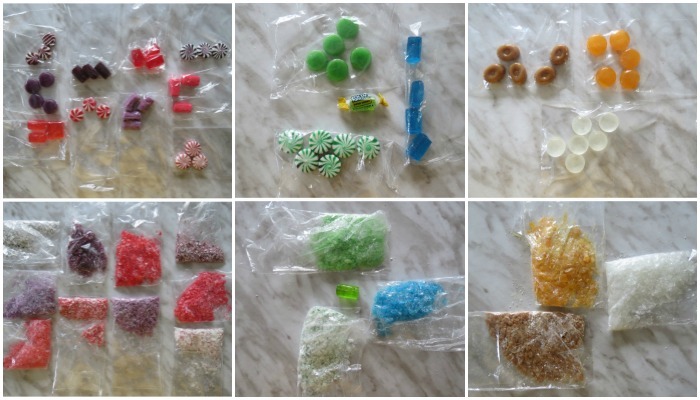 Sort & Crush Candies: Sort each candy type into a sandwich bag. 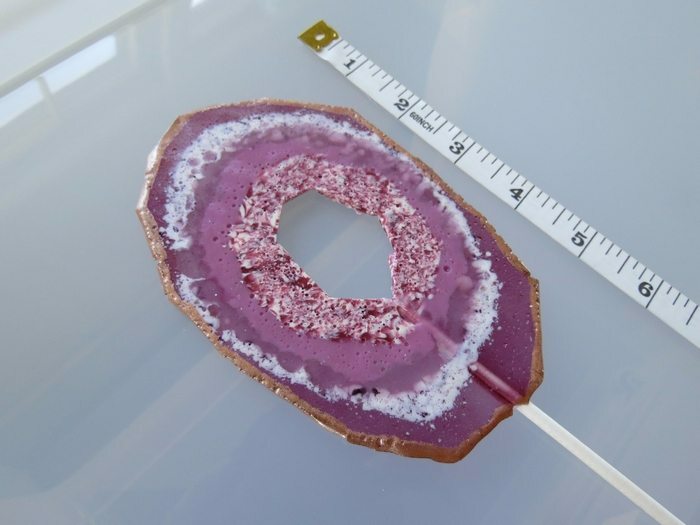 I found that 4 types of candies and 2-3 pieces of each candy are sufficient to make one 5″ agate. 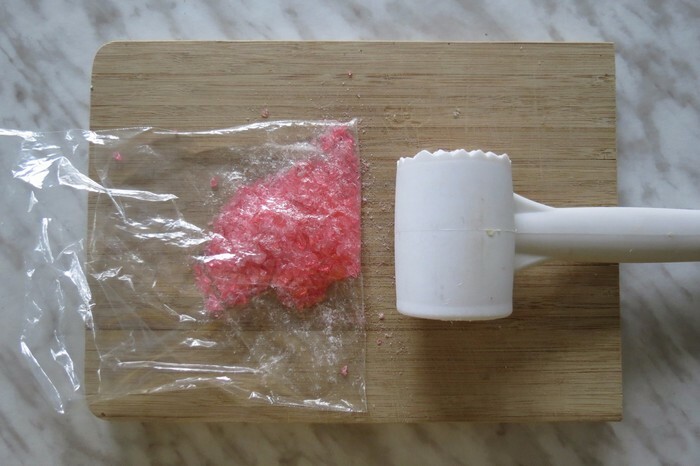 Crush candies on a chopping board with a mallet or meat tenderizer. No need to crush them too fine. For reference, they can be crushed the size of sea salt or rock salt. 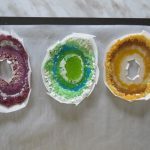 Parchment Molds: I came up with the molds after baking an experimental batch directly on a sheet of parchment where the agate slices got too thin because the melted candies spread out too much. 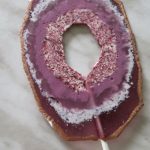 The walls of the mold stop the candy from spreading and the agate slices have a little more thickness, than if baked without. And the mold also helps you to precisely control the finished shape. 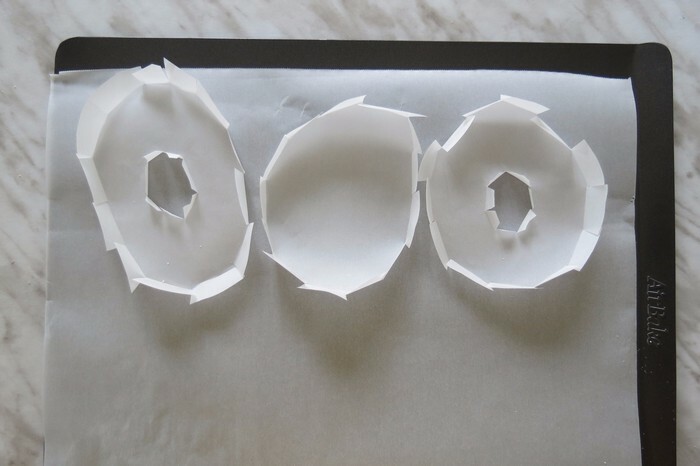 Cut random agate shapes in parchment. Mine were about 5-1/2 to 6″ tall as I wanted it large enough to include several layers of candy for a good ring effect. Snip 1/2″ around the circumference at about 1″ intervals. 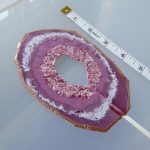 If you prefer agate with a hole in the center, cut a hole through the center and snip 1/2″ around the circumference at about 1/2″ intervals. 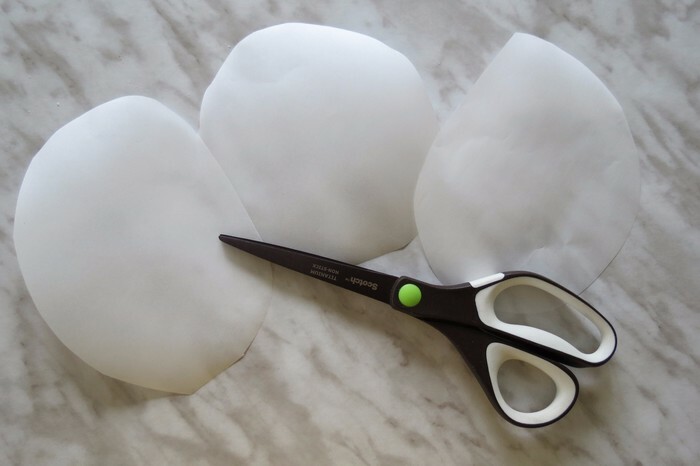 Fold to make side walls for your “molds”. 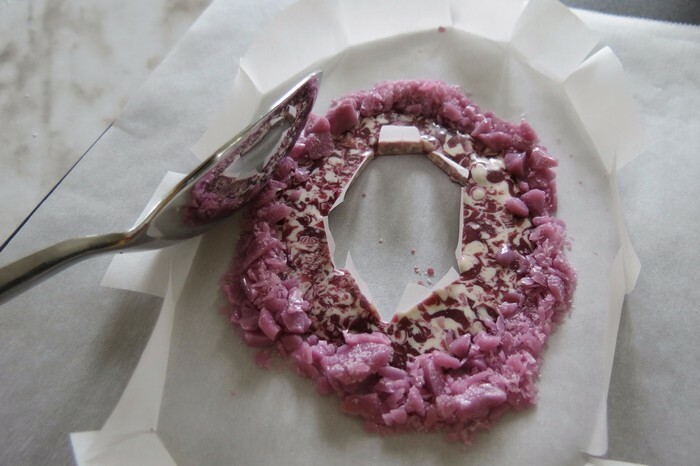 Put your parchment molds on a baking sheet lined with parchment. Layer & Bake & Layer & Bake: Now for the fun artistic part! 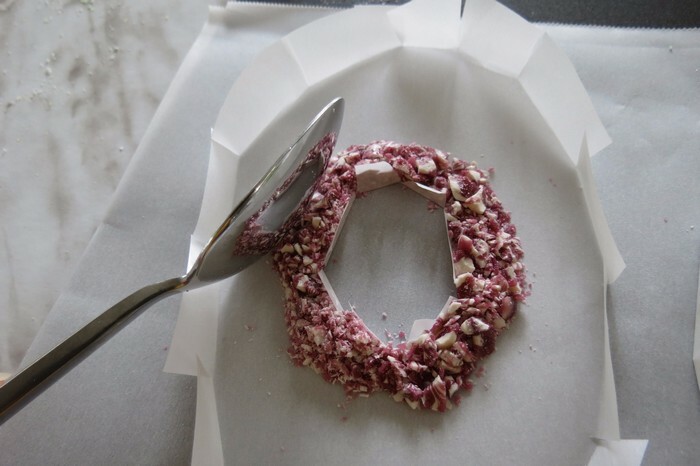 Arrange desired crushed candy as the first “ring”. I use a teaspoon to carefully place the crushed candy and use the back of the teaspoon to push the candy in and ensure there is no stray candy elsewhere on the mold. When using molds without a hole in the center, simply put a solid candy piece in the center. I worked on 3 molds on one baking sheet. VERY CAREFULLY slide in the oven. Bake at 300F for approximately 4 minutes (note that every candy brand is different and some candies require more time to melt than others), keeping a close eye until the candy is mostly melted, but does not spread too thin. 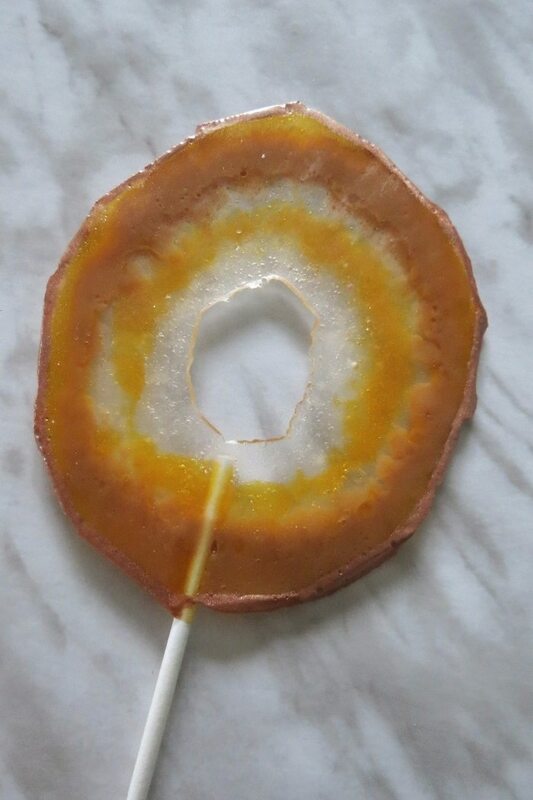 If using a solid candy piece for the center, you can take it out of the oven if it’s not entirely melted because it will continue to melt after each successive bake. 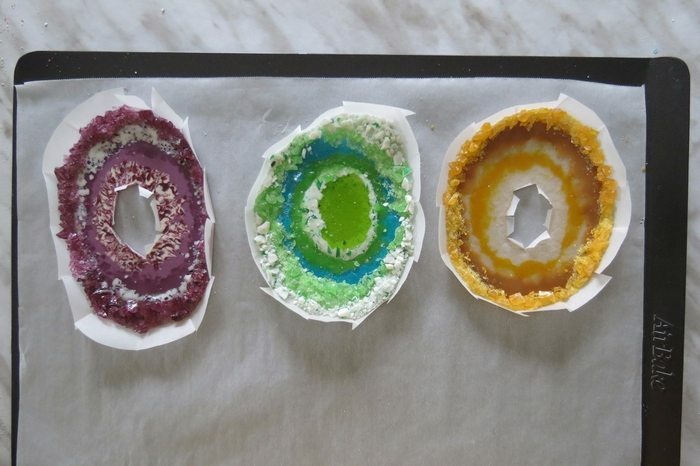 Repeat steps 1 and 2, arranging crushed candy and baking for approximately 4 minutes (or until melted), for each and every layer, until the mold is filled. 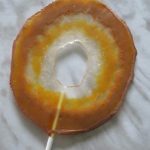 After the last layer is baked, immediately place a lollipop stick and fold the stick over to coat, while the candy is still hot. Let cool for 10 minutes. 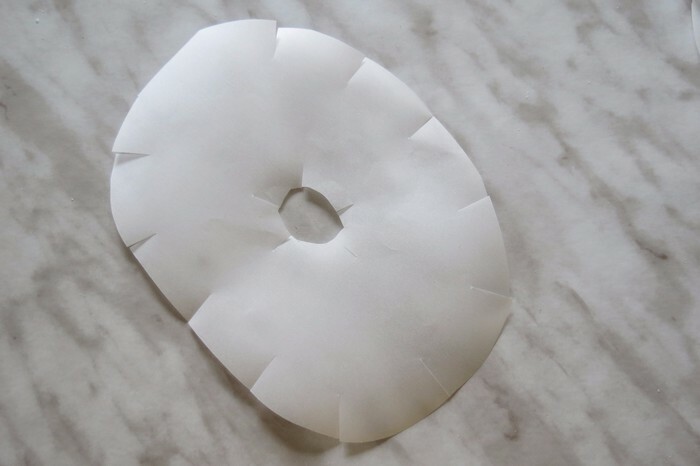 Peel off parchment molding. 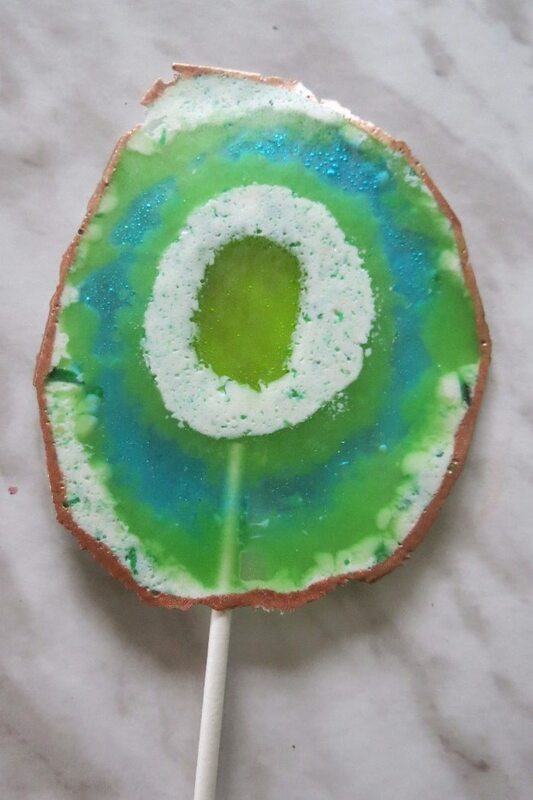 I prefer to use the baked underside as the “top” of my lollipop because it is more flat and flush. 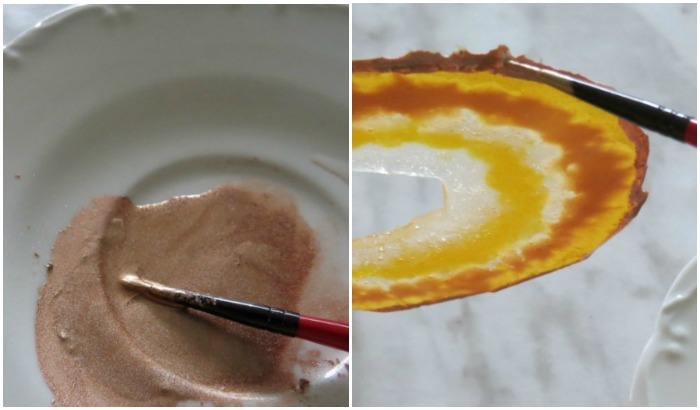 Optional: Dilute edible shimmer powder in water and paint the edges of the candy. I used copper and silver shimmer powder. Admire, eat, share, and enjoy! Thanks to paperplateandplane for this fun food idea! Next articleEasy Sugar-Free Banana Bread!